CrossFit NOLA welcomed me into their facility with open arms and treated me as one of their very own. It didn't take me long to settle into the amazing community that they have created there. I frequently reminisce about all the great people I was so privileged to meet and all the awesome experiences we all shared. Needless to say CrossFit NOLA is hands down one of the top gyms in Louisiana for both the results and the community they've produced. I'm more inclined to visit the city, not for my alma mater (Tulane), but rather to see my old friends and family at CrossFit NOLA! If you are EVER in the area, get to one of their facilities (CrossFit NOLA and CrossFit NOLA 504) and experience it for yourself! Thanks again to Jeff, Mollie, Liz, Brandon, Demian, Brad, Eric and Rae for everything and some! I am forever grateful. 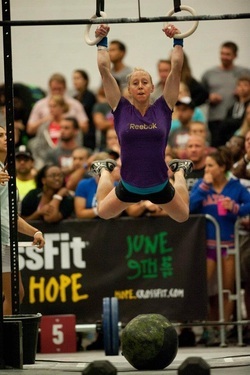 "I started my crossfit experience at crossfit NOLA last June (2011) and it has been awesome! Between the training and the paleo diet, I'm getting back into some of the best shape of my life. In short, I love CrossFit, I spend less time at the gym, and I get excited about going!" I consider CF NOLA my home away from home! I visit every time I'm town. What a great gym, great coaching and awesome community! I wish I could make it back more often! I have been Crossfitting for about 5 years, and I also travel quite frequently. 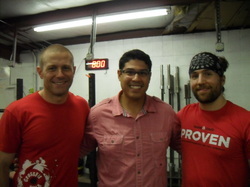 I am very fortunate that my friends at CrossFit NOLA let me drop in during my visits to New Orleans. 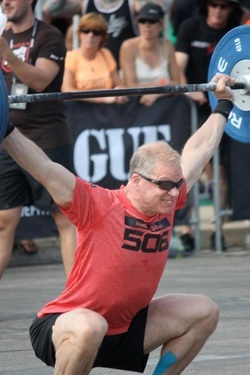 The WOD programming is great, which allows me to stay in great shape during my competition training. But it is obvious to me that there is much more going on at CrossFit NOLA! The coaching is outstanding, with lots of attention and individual training being doled out. It is also very apparent that CrossFit NOLA has a hugely supportive community - evidenced by all of the very friendly, very enthusiastic, and very FIT athletes I meet during each visit. Thanks so very much for your hospitality Mollie, Jeff, Liz, and Brandon! If you are considering CrossFit, or are a CrossFit athlete looking for a great place to train, I highly recommend CrossFit NOLA. They are great! I am Luis and I want to recommend CrossFit NOLA to everyone who is interested in making big changes in life. I started training because I was overweight (250lb) and the regular gym was not working for me. I was tired of working hard and not smart. 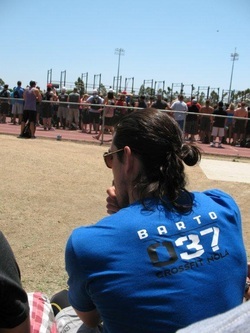 I heard about CrossFit and joined a different gym in June 2010 at a location where the Work Out of the Day was the most boring activity of the day (bad) and the instructors help was not appropriate. So after a few months and zero results I quit ( august 2010 ) then tried again for a month just to make sure I am not a quitter but I finally quit for good in October 2010. I tried some spinning classes to control my 250 lb but it did not work. Tired of working hard I started a research about other CrossFit locations in the city and I found gyms that offer crossfit as a class (boring classes and uncertified trainers). After 5 months (November 2010-April 2011) of a research and bad luck trying to find a challenging crossfit facility, I found CrossFit NOLA. As soon as I got there I met Jeff (one of the owners) whom I briefly explained my situation, Jeff invited me back later that same day. What I experienced that evening was a real workout and a coach that motivates you to keep going until the very last round. Since April 2011 I have been losing weight (218lb), gaining muscle, eating and living a better life. The coaches at CrossFit NOLA motivate me every day to work smart, not hard, to stay away from injuries or muscle stress, and to finish what I started (the WOD); but what I really like about CrossFit NOLA is that we warm up as a group, we stretch the muscles as a group, then we do the WOD as a group. This is real CrossFit! "You probably get these "Crossfit Changed My Life" emails all the time. So I will not disappoint. CROSSFIT CHANGED MY LIFE!!!! I don't have time to catalog all of the areas of life/work that have benefited, but suffice it to say - I can't think of a single aspect of my life that has not improved because of CrossFit."